Relief from hip pain may seem impossible when you are in the middle of an intense pain cycle after injury. There are strategies, however, that can reduce if not eliminate your level of discomfort so that you can return to your normal activity level. If you find that stretching, exercise, weight loss and ice/heat therapy are not enough, then you may need to invest in braces, proper shoes or other supplies for a more intensive rehabilitation. A regimen of basic leg stretches and daily exercise can work wonders for someone who has a sedentary job and may be experiencing more hip pain through the years because of osteoarthritis or other issues. In other cases, too much exercise or rough play on the field or in practice can lead to muscle strain. This type of strain may settle into the piriformis, a muscle that can affect the sciatic nerve and cause pain to radiate through the hips and the back of the legs. In these cases, regular icing and heat can be beneficial. For pain such as this, you may want to use a cold therapy system that controls the temperature in a more efficient manner than ice for a deeper, consistent level of pain relief. For more intense support, braces and rehab supplies can give hips the protection they need in recovering from falls, sprains and strains or other injuries. 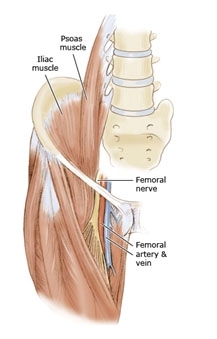 One of the more common injuries is hip flexor strain. This type of pain can be debilitating if left untreated. Various hip protector garments, compression gear and hip abduction orthosis can assist to stabilize the affected muscles, which will help you get back on your feet or on the field as an athlete. Weight loss also can be instrumental in reducing the amount of stress placed on your hip muscles. With an increase in exercise, you may not only see overall pain reduction in your body, but also the subsequent weight loss can bring an added amount of hip pain relief. Weight loss is an important tool in battling the symptoms of chronic disease such as diabetes. As part of disease management, therapeutic shoes can be essential for circulation and balance to help maintain even weight distribution in your daily activities. With the stylish types available from manufacturers specializing in this footwear, you will find that these types of shoes look just like any other shoe. The one difference is that these shoes can provide a superior level of comfort and quality. MMAR Medical can assist you with finding the right high-end orthopedic rehab and sports medical products for hip pain relief.